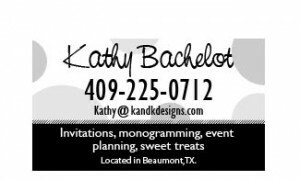 You are here: Home > Custom Bridal Designs > K&K Designs – SETX Event Design – Floral, Invitations, Planning & More! Are you looking to minimize your Southeast Texas wedding planning stress? K&K Designs offers Southeast Texas event design from concept to completion. You already know what your wedding should look like- the theme, the colors, the lighting. A consultation with event planners K&K Designs brings your Southeast Texas wedding vision to life. 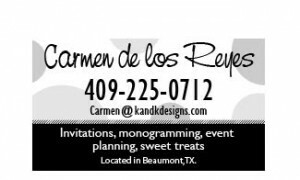 K&K Designs specializes in making SETX weddings run smoothly – from designing your invitations and reception to keeping your big day on schedule and larger than life. They have the professional expertise and experience to bring everything to life- your colors, your theme, your vision. Many brides start their Southeast Texas wedding design with having K&K produce a logo that will appear throughout the wedding, a unifying symbol that ties the whole event together. K&K offers custom designed wedding invitations, addressed coordinating envelopes, RSVP cards (addressed), detail maps, menus, seating charts, place cards, table numbers, reservation cards, save-the-date, bridal shower invitations, rehearsal dinner invitations, personalized thank you notes, candy bar labels, favor tags and any other item their brides may need- or want!- to complete their wedding stationery. 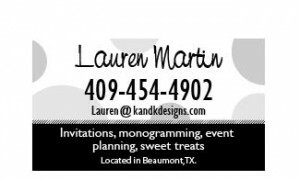 K&K can also take your SETX wedding monogramming well beyond your your stationery. K&K Designs also assist their brides with elegant Southeast Texas floral design. K&K has been recognized internationally for the high quality and beauty of their wedding florals. They also have an extensive selection of antique silver that can be used to showcase your wedding flowers. K&K assists their Southeast Texas brides with all of their floral design from bridal party bouquets and boutonnieres to fabulous custom centerpieces. Have you been searching for the right Southeast Texas wedding florist? Call K&K Designs to schedule a consultation today. You’ll be amazed at the wonderful design and quality – all right here in Southeast Texas. K&K Designs can also coordinate your catering to ensure everything matches the theme and feel of your wedding reception design. By overseeing the quality of taste, texture, and visual presentation, K&K can help ensure your guests are blown away by the quality of catering, and every other element, of your Southeast Texas wedding reception. Are you looking for a truly different approach to the groom cake? K&K Designs also assists their Southeast Texaas brides with wedding cake design and coordinates private tastings with their preferred vendor. You have your Southeast Texas wedding monogram, beautiful invitations, elegant floral arrangements (did you opt for the antique silver containers? ), catering, and catering. What else you you need to achieve your Southeast Texas wedding vision? K&K Designs can provide wonderful Southeast Texas wedding rental decorations to further tie your theme together. From bird cages to one of a kind table toppers to antique china and silverware, K&K designs can ensure every element your guests see reflects your Southeast Texas wedding vision. With their profesional interior designer’s eye and a knack for putting a look together just so, K&K Designs makes your Southeast Texas wedding reality exceed your most beautiful dreams. Call today to schedule a bridal consultation with K&K Designs. You’ll love the way they bring your wedding to life. Kay Ford Clark is the backbone of the K&K Designs team. 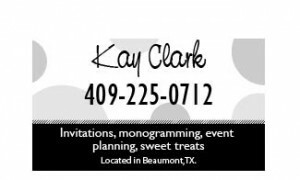 Kay is a retired teacher, with a Bachelor’s and Master’s degree in Education from McNeese State University. After numerous years of doing beautiful hobby handwork, she joined with her daughter, Kathy, and went into business so she could share her talent with others. Kay concentrates primarily on monogramming, embroidery and sewing design. Her critical eye and handwork is second to none. Her specialty one of a kind creations for SETX brides are exquisite! Vicky Broussard is a computer designer on the K&K team. She works tirelessly to get all designs fine tuned and ready for print. 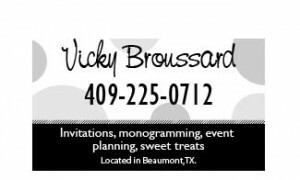 She can work with SETX brides to create beautiful wedding designs . Vicky is also a master at digitizing designs to make them ready for monogramming or embroidery. When K&K creates a design for the client, Vicky will do the initial work so that each aspect of our project will link to the other, making each event or project unique. Jack Holden is our Southeast Texas wedding technical advisor. It takes all of his time to keep us designing, printing and plugged in! He is a wizard in technology and network support. Jack uses his vast talents assisting with all of our projects and events. Marketing and creative writing are high on his list of daily tasks. 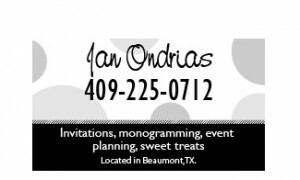 Jan Ondrias has been working K&K Designs us on conventions and corporate events since 2002. She is from Wharton, TX and has over 25 years of experience in floral design and wedding coordination. She is our hands on bouquet, corsage and boutineer designer. With her magic touch she makes all of our designs come to life.